Chimney Balloon LTD was founded in England in 1989 by the inventor of the Chimney Balloon, plastic engineer David Woodman. One cold windy day David was working in his drafty study and he noticed his fireplace was emitting a significant amount of cold air. He had his fireplace flue stuffed with an ineffective solution of crumpled-up newspapers, but the uncomfortable draft continued. Chimney Balloons are manufactured in England by a skilled team of Chimney Balloon craftsmen. Manufacturing air tight durable Chimney Balloons in various standard and custom sizes requires a thorough knowledge of plastic engineering and an eye for detail. 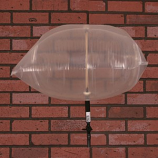 Energy raters, insulation contractors, chimney sweeps, masons and fireplace and wood stove owners all over the world rely on the Chimney Balloon to be a simple and effective tool to save energy and stop cold drafts. The balloon is also commonly used to stop chimney odors, insect, bird or bat entry issues through the flue. keywords: chimney, fireplace, draft stopper, chimney flue.